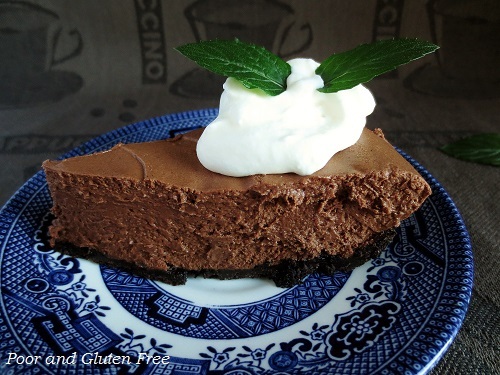 This chocolate mousse pie is so decadent, so rich, and utterly fabulous. This is the type of thing you want to roll around in your mouth for a little while it dissolves on your tongue. And yet the process isn't difficult and doesn't require any fancy stuff. The pie crust is a faux cookie crumb crust, which means it doesn't even require gluten free chocolate cookies to make, just a few basic ingredients. 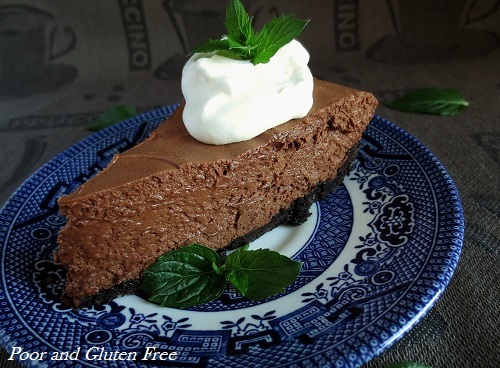 There are three components to it but only one is absolutely necessary (the chocolate mousse), so you can choose if you want to layer that on the gluten free chocolate pie crust and top with mint whipped cream. And of course, I recommend that you do, but the mousse is wonderful on its own. 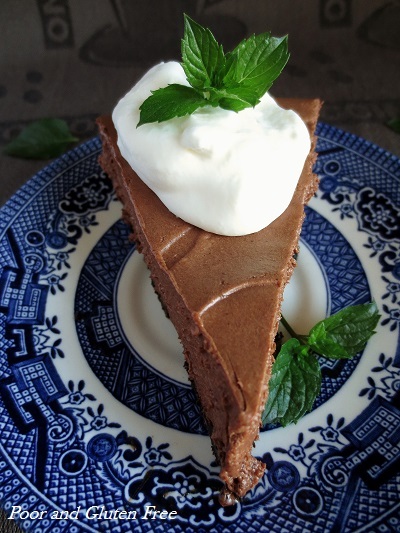 You can also do away with the mint flavour if you prefer but the mint adds a delightful fresh, lightness to the rich mousse. See? 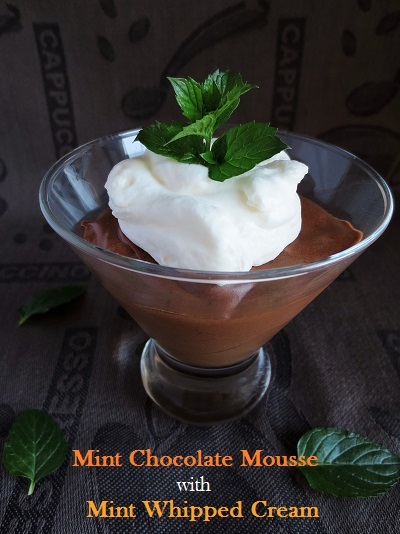 The Mint Chocolate Mousse can easily be served all on its own. 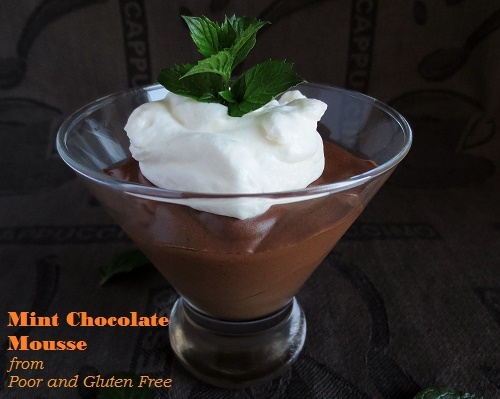 And btw for you frugal folks out there - I served this mousse in a martini glass I picked up at a second hand store for $0.95. Martini and shot glasses make fantastic and funky mismatched serving dishes. I garnished them with some mint sprigs from a pot of mint I've got growing on my deck. The mint itself initially came from some springs my mother-in-law pulled out of her garden. I got the pots (very nice ones in perfect condition) for free as someone in my apartment complex was giving them away. I prepare the crust first, then while it's baking and chilling I prep the mousse. Lastly, while that's chilling, I make the whipped cream. The only time-consuming part of this is the wait! 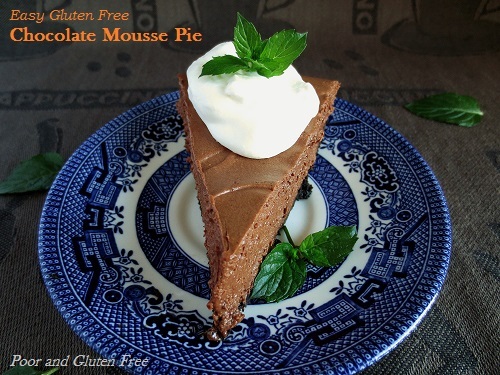 1 batch Gluten Free Chocolate Pie Crust, baked according to directions in recipe and cooled. 1. In a pot or microwave, bring 1 cup whipping cream to a boil. Pour over chocolate chunks and whisk with vanilla until chocolate is melted and mixture is smooth. Cool to room temp. 2. With a whisk or beater, beat 2 cups whipping cream with salt, sugar, and peppermint extract to form stiff peaks. It's best if the bowl, beaters, and cream are chilled. 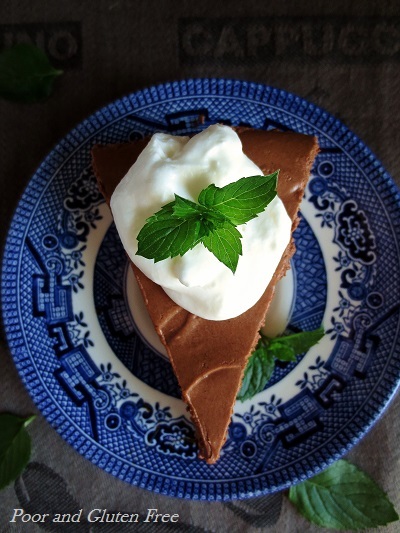 Fold whipping cream into chocolate mix and pour over crust or into serving containers. Chill at least 3 hours before serving. 1. Using a whisk or beater, beat cream, sugar, and mint extract until stiff peaks are formed. It's best if all utensils are well-chilled. Serve immediately or keep whipped cream chilled until use. Have you ever had a flavoured mousse or whipped cream? 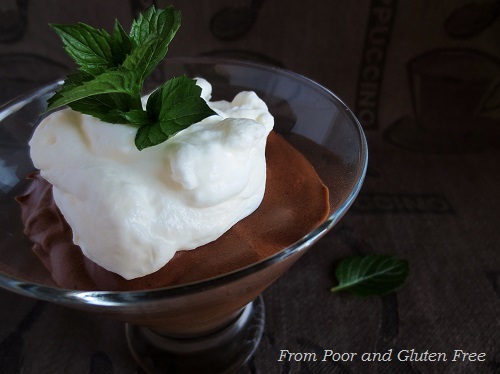 What's your favourite way to have mousse? That looks sooooo delicious Danielle!!! OMG! What a fabulous looking pie! Pinning this one for the holidays! 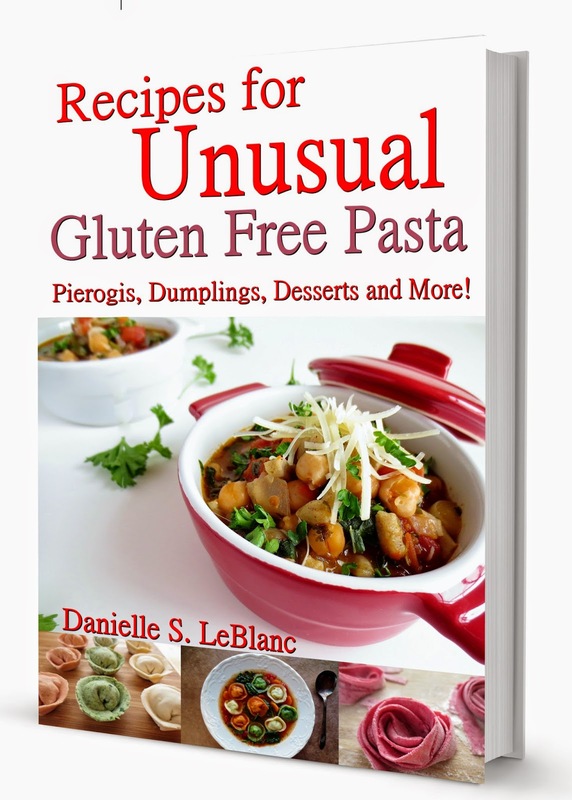 Delicious Danielle, thanks for sharing with Hearth and soul blog hop, pinning and featuring on this week's blog hop.